"Been such a long time gone" to paraphrase Hugh Masekela from his "homecoming" tour to Southern Africa in 1980. But already that holiday feeling has passed and the real dread of corporate servitude is weighing me down. But visiting Berlin after a 10 year absence was great. 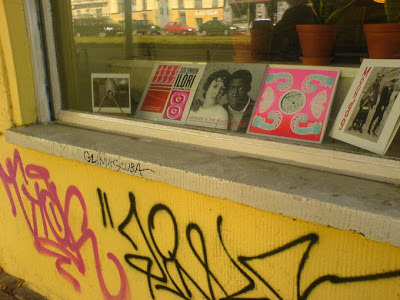 Musicwise I'd been warned to expect little but on my first day walking near the hotel in Mitte I found three vinyl stores and picked up some gems including two Gnonnas Pedro LPs, an Idy Diop LP on Ndardisc, the Dr Nico LP that has him leaning back on a red Falcon and a Syliphone LP amongst others. All of the stores were around the Torstrasse area. One of them simply called The Record Store had a number of Frank's (aka DJ Soulpusher from the blog Voodoofunk) LPs and singles on consignment. 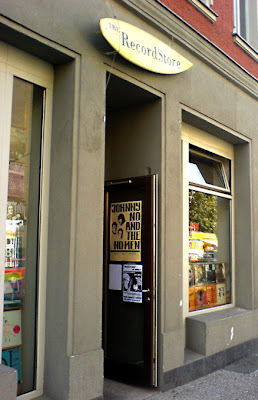 Check the nice Honest Jons display from the "Dig a Little Deeper" store. And thats all for now! glad to see you back. sound like you found some great stuff in Germany - hopefully we'll get a chance to hear some of it. Welcome back and with such a lovely post too! Do you happen to know what year(s) the underlying Western Jazz singles came out? I think I might actually prefer it overall to Ujamaa, although the Nuta Jazz and Dar Es Salaam Jazz tracks there do kill. This is definately another album that I'm taking to my desert island. Wonderful. thank you for all the treats. Unfortunately without an account, both sendspace and megaupload will not work at all here in the Czech Republic. How about uploading to sharebee - giving us a variety of choices? Unfortunately sendspace says the link to the Western Jazz Band was removed. I was trying yesterday – but sendspace is busy most of the time. Is there any chance of a reup? Would be warmly welcomed! well, I guess it's good the was it is: things come, things go. I'm curious to see what comes up next. And thanks for your fast answer. 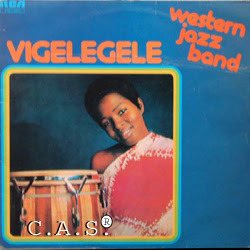 Any chance of re-uploading the Vigelegele LP? I missed it when it was still on Sendspace. i missed the vigele download. i just saw it today.